I must have a bazillion measuring devices - spoons, cups, beakers, jars, pitchers ... and of course, a scale. 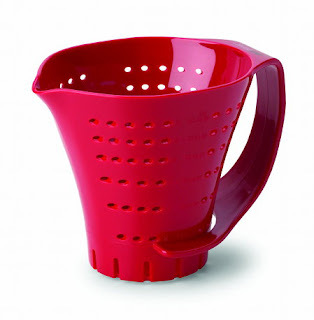 But the measuring colander from Chef's Planet ($10 for 2-cup; $13 for 3-cup) is unique among its brethren because it has holes. Lots and lots of holes. The idea is that you can use the colander to measure, drain, and rinse foods. Like when you've got berries. Or cherry tomatoes. Or olives. Or canned goods where you don't need the liquid. I have to say this isn't the most revolutionary product ever, but I've never seen anything quite like it, and it makes a lot of sense. Even if you don't need to measure, it makes a nice colander. I have a big colander that I use when I've got a lot of stuff to drain or rinse, but I usually use a strainer for smaller batches. That works well enough, but sometimes I lose a few bits that sail over the edge of the strainer. Since this is shaped like a cup, I'm less likely to lose those canned beans as I drain and rinse them. The measurements are marked at the holes in the colander, and I (sort of) wish they were a little easier to read, but like any measuring cup, after I use it a few times, I'll know which mark is the one I'm looking for. It measures in half-cup increments, which is good enough for lumpy-bumpy foods like strawberries. And you could certainly eyeball quarter-cups if you needed to. My only slight quibble is that I wish the holes were a bit smaller, so I could use this for rinsing rice or other grains. On the other hand, that would make it less efficient for rinsing dirty strawberries and getting rid of all the grit. So the hole size makes sense in that regard. As a little bonus, the bottom of the colander is designed to fit a standard tuna can, so you use this to drain tuna. I usually just use the tuna can lid, but I can see how this might be a little more efficient if you're draining a lot of cans. Overall, this is a pretty useful item. Not essential, but handy to have. This was provided to me for the purpose of a review on Serious Eats.